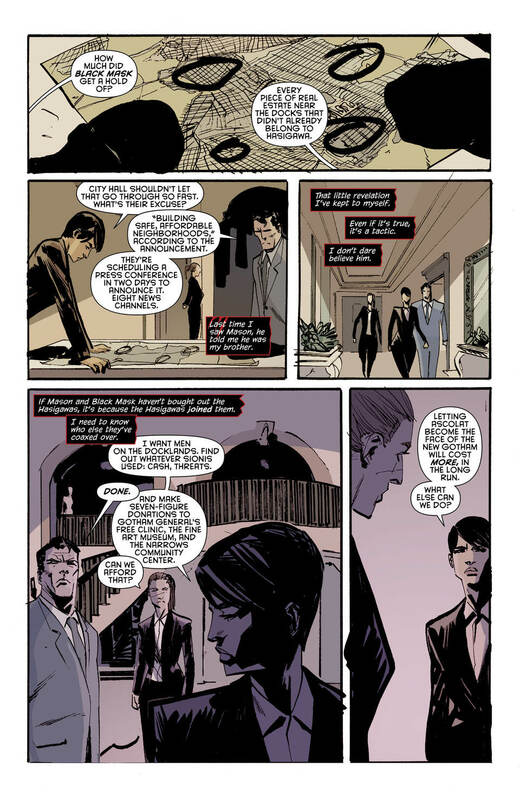 One of the sleeper changes happening over in a Bat-Family of books filled with relaunches and new directions is Selina Kyle’s relinquishment of the Catwoman role and acceptance of the title of mob boss for the Calabrese family. 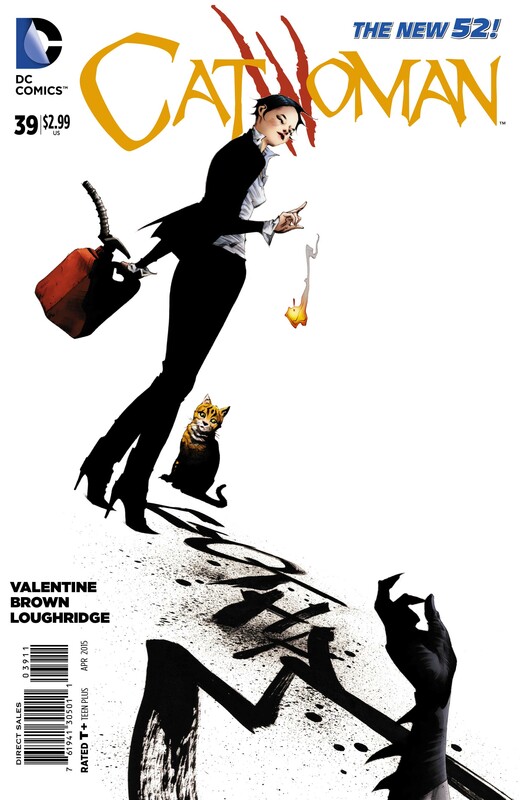 In a “The Godfather Part II crossed with The Dark Knight” manner, writer Genevieve Valentine has moved Selina into a position of power that she might have to fight tooth and claw to maintain. Valentine generously took time once again to answer some of our burning questions about the nature of Selina’s new role, the appearance of the new Catwoman, and that moment that rocked this author in issue #39. MSG: Genevieve, thank you so much for taking time out for Comicosity! Looking back over the issues since October’s change, how are you feeling about reaction (including your own) to Selina’s new place in the world? GV: I’ve been overwhelmed by the positive reaction to Selina as a mob boss; I loved the concept as soon as I heard it, and I’m glad others have been enjoying it as well! 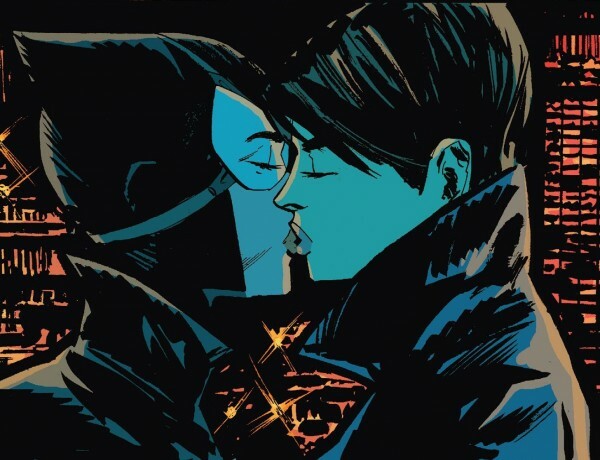 From what I’ve seen, a lot of the positive reaction has been about giving Selina a chance to fold back into the Gotham story more directly while keeping her independent and true to character. At heart, Selina Kyle is a thief, but the essence of a thief is someone who takes what she wants while accepting the dangers; having her as a mob boss is that same concept writ large. MSG: Even as a character that has experienced various motivations over her long publishing career, the role of crime boss is a new one for Catwoman. How do you negotiate this wealth of power (and the constant risk of losing it all) with maintaining a state of agency for Selina as a character? GV: It’s definitely a challenge! It’s forced her to confront who she is and make some occasionally-unpleasant discoveries, which is always important to building character but not very pleasant to put that character through. But it’s also given her a new degree of power in Gotham itself, which is always going to be hard to walk away from, and we’re reaching a point where she’ll have to face that truth, too. In terms of agency, I find it fascinating: she’s such a free agent at heart that her first instinct is always to keep moving, so for her to stake her claim to Gotham in this way reflects both how shaken she was by what brought her there, and how determined she is to take control of the thing that rattled her. The question is, will strange loyalties sneak up on her? MSG: It’s actually very odd, even after such a short time, to type “Catwoman” and mean Selina Kyle — her situation having been transformed so radically and potently. Why has she been so open to the idea of another woman taking over this identity that was at her core for so long? GV: I think Selina is a fairly cunning judge of potential – I think she’s had to be, her whole life. This new Catwoman was mostly, it’s implied, handling business that didn’t affect Selina; she had no problem with the Hasigawas back then, but no obligations either – so if Catwoman wanted to be a snarl in their hair, where’s the problem? By the time we meet her in #35, the implication is that Catwoman is getting closer and closer to home, at which point Selina had to have it out with her. 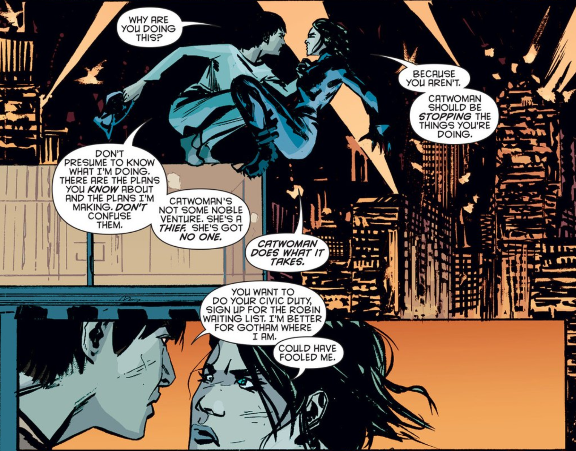 But I think that Selina’s lingering guilt over the evils she knows she’s involved with are what keep her from getting territorial about the title. If she can’t be her own Catwoman yet, then it’s just as well that Eiko can. MSG: Speaking of Eiko, a rather important moment occurs in the pages of issue #39 that may blow the roof off the internet this week. Are we seeing the beginning of a relationship between Selina and her successor, and what will that mean for their families? GV: I think Selina and Eiko have been drawn to each other from the beginning; I mean, the very first time we saw Eiko, she was keeping watch over Selina in a very pointed way! One born to the lifestyle, one who sort of kicks the door down and takes over, but both conflicted about their positions, both doing the best they can to navigate this incredibly tense situation. And while they’re both smart enough to realize the dangers of trusting anyone, they’ve been open with one another in a way they’re not open with anyone else. It’s an odd trust, but sometimes that’s all you have, and I think it’s created a situation that they’ll definitely have to come to terms with together. MSG: Selina’s investment in Gotham City’s welfare is not unheard of given her past, but what in your mind is the spark of motivation that drives it today — but in #39, is it outweighed by her commitment to the family name? Or is that simply a means to an end? GV: Ugh, this is such a great question, because of course, even Selina can’t really be sure. Part of the fun of this arc is playing out just what she knows that we might not know. 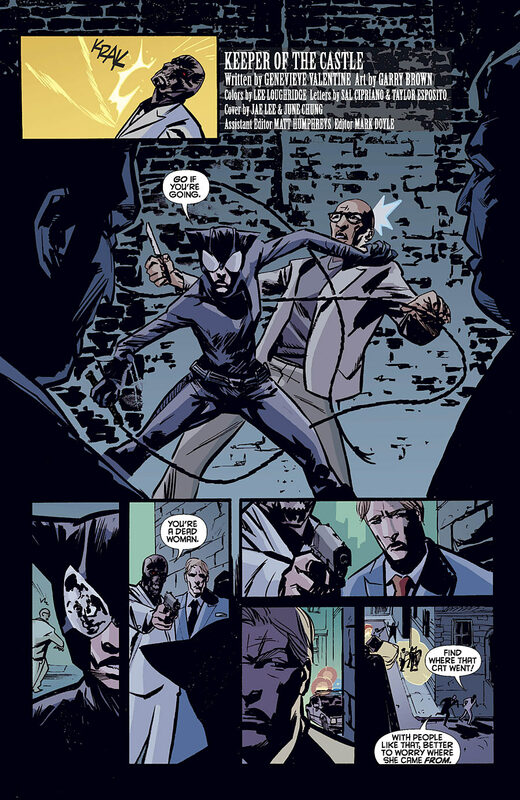 Protecting Gotham from Black Mask, sure, but she’s already racked up a lot of decisions that we know still haunt her, and have shaken the foundation of trust with Antonia — though of course, that same big decision cemented Ward’s belief that she has the family’s long-term interests at heart. 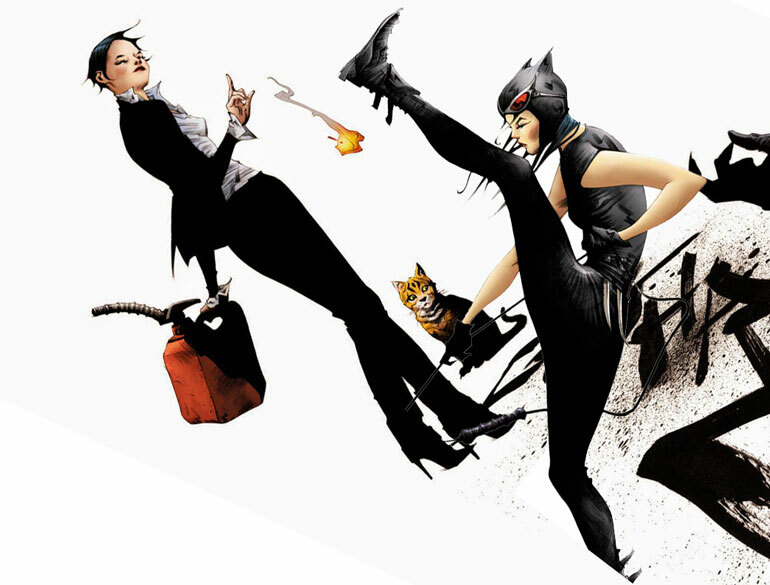 In some ways, that’s a small-scale dynamic that Selina’s up against in Gotham, too. This determination to do what’s best for the family is a sword that cuts both ways; if protecting the family name is the most important thing, does that mean accepting defeats? Or does that mean risking everything? Selina herself might not always know, which is one of the reasons that her fans love her so much, I think; having so many conflicting impulses and being unsure of yourself are really human flaws, and that’s always been part of what makes her interesting. MSG: The letters you’ve woven through the series from powerful women throughout history have added this real sense of gravitas to the narrative. Why did you choose the ones you have, and how do you personally imagine the Catwoman measuring up to these great women? GV: I love the quotes, so I’m glad you said that! In my mind, Selina has spent her life reading up at any chance she got, so it was a natural fit to imagine her picking up these books and trying to learn from them once she takes on a leadership role. I tried to pick several quotes from and about recognizable historical women, though it will come as no surprise that a lot of the words of powerful women have been erased, historically. And of course, sometimes there are no letters to draw from – Ching Shih left no letters behind, so in #37, I actually used a newly-commissioned translation of a Chinese poem from the Tang Dynasty, one that had nothing to do with Selina. That issue’s central relationship was its own entity, and the poem worked well to encapsulate something Selina couldn’t really touch. Personally, the more I read from powerful women, the more I think that no one ever thinks powerful women can succeed, and often even in the aftermath their stories get reshaped by the voices of others – primarily men – which makes it very hard to determine what, exactly, you’re living up to. You get the Lucrezia situation, in which several 19th and early 20th century accounts paint her as a fluttering hostage of a family of brutes, except that it only takes about three letters (about her or from her) to realize she was a master of statecraft, and if her enemies disappeared, that was probably not a coincidence. In that sense, I think many great women of history have been, either beforehand or after the fact, deeply underestimated. And I think if there’s one thing Selina Kyle knows how to exploit, it’s being underestimated. MSG: Garry Brown is moving on after this initial 6 issue arc, but word is you’ll be working with David Messina. Can you reflect a bit on the work of each penciller and how you’ve written to their particular sensibilities? GV: I loved working with Garry; I was a total comics newbie when I joined this book, and I lucked out getting him. 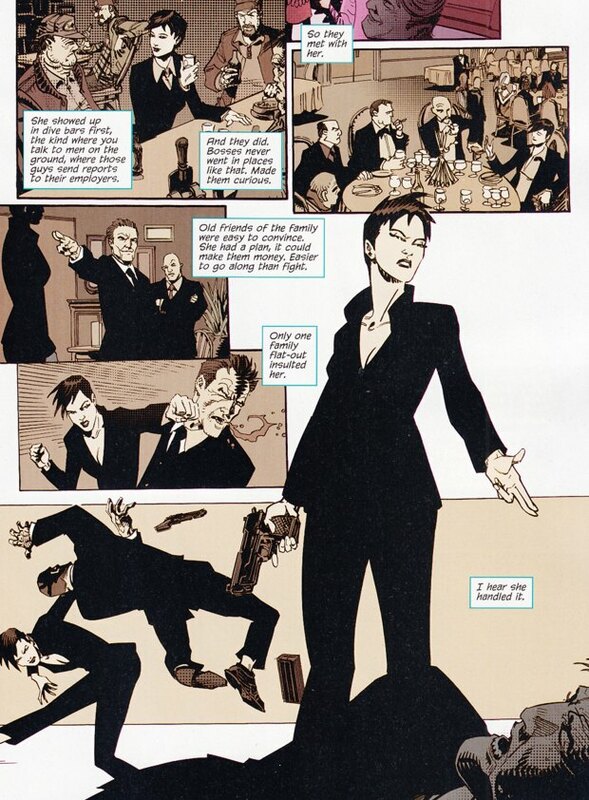 I love that he draws Selina as a dangerous woman. I loved the tension he could create in the beats just after fight scenes (which I am a sucker for in movies and was always gleeful to get here), and he had a sense of Gotham’s architecture that made it into a breathing character that could get angry or recoil, and I’m so grateful to have had that for this arc. I’ve just begun working with David, which for poor David has meant several fashion collages and inspiration images, to nobody’s surprise! But I’m looking forward to seeing how things look as we enter a slightly different phase of Selina’s rule over Gotham. MSG: Any teases for the final issue of your first arc, or what we can expect to see from Catwoman come June? GV: Well, as you seem to be anticipating based on some earlier questions, Selina’s going to have to make a decision soon about whether to go to war, and what that would mean for Gotham. Of course, she always has a few tricks up her sleeve; like any ruler, she would never go to war unless she thinks she can win. On the other hand, only one side wins a war like this, and some of Gotham’s own will get drawn in in ways they never expected. When we join back up with her in June, that’s all beginning to spin out – and while I can’t say more, I’m really excited about the possibilities! Catwoman #39, written by Genevieve Valentine, is in stores and online now! Run!